INDIANAPOLIS—Appearing intently focused and grunting loudly as he put all his weight behind each hook and jab, Republican vice presidential candidate Mike Pence was reportedly seen Monday training for the upcoming vice presidential debate by repeatedly striking a punching bag with an Intergovernmental Panel on Climate Change study taped to the front of it. “You’re going down,” said Pence, clad in a sweat-soaked tank top and nylon trunks as he clapped his boxing gloves together, cranked up the stereo system in the basement of the Indiana governor’s residence, and began pummeling the 32-page summary of climate change statistics and policy recommendations that was taped to the 150-pound hanging training bag. “Come on, is that all you got? You can’t stop me. 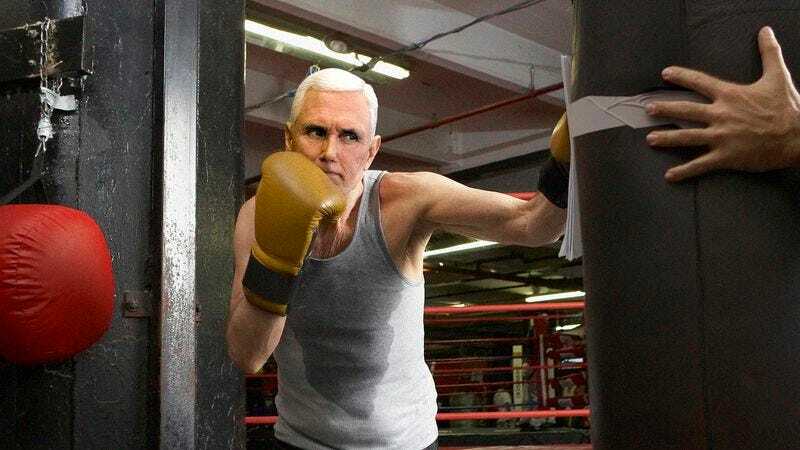 I will wreck you.” After finishing up the environmental portion of his debate preparation, Pence reportedly switched to a speed bag with the Roe v. Wade ruling affixed to it.